The World Summit on the Information Society ended with talk about narrowing the technology gap between rich and poor nations but little in funding. It was overshadowed by a lingering resentment about who should oversee the management of the net. The summit was also marked by stark differences over freedom of speech. More than 170 countries and some 17,000 participants attended the UN's largest ever summit, billed as a "summit of solutions", in Tunis. It ended with declarations of a "Tunis Commitment", and a "Tunis Agenda for the Information Society". The documents largely reaffirmed pledges made at a first summit in Geneva two years ago to step up efforts to help poorer countries benefit from information and communication technologies. But while nations acknowledged that current funding was not enough, there was little in the way of new money. Technologies and knowledge would also drive all countries towards internationally-agreed development goals and objectives, including the Millennium Development Goals, it said. There was also support from delegates and participating nations for a similar gathering in a few years' time to re-address issues and to take stock of progress once more. For his part, the Chinese vice premier Huang Ju told delegates that some online restrictions were needed to protect states, although China wanted to "guarantee freedom of speech". 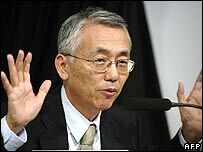 Speaking of the tensions, Mr Yoshio Utsumi, secretary general of the International Telecommunication Union, which helped oversee the summit, said: "Freedom in cyberspace is a pre-requisite for an information society." "Our objective is the free sharing of information. Only with this free flow will we be able to create the information society," he told the BBC News website. Everyone should have the ability to create and share information, he said. "Only with these activities can we expect a people-orientated information society." On cybersecurity, he said that there were lots of forums to tackle the issue, which the ITU would have a role in, but there was no concrete international standards. 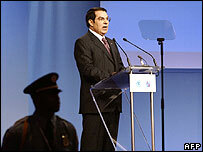 Much of the summit was dogged with controversy over the choice of Tunisia as the host nation. A closing new conference by freedom of expression groups ended in heated exchanges. 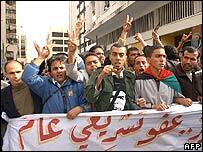 Steve Buckley, chair of the Tunisian Monitoring Group, called for a full investigation by the UN into the treatment of rights campaigners during the summit. The head of media freedom group, Reporters Without Frontiers (RSF), was blocked from entering the country. Tunisian authorities defended their actions, saying it was because of pending legal action against him. There was also protest against last-minute changes to sessions run by the Civil Summit on the Information Society (CSIS), organised by non-governmental and civic groups. The RSF staged a protest in the main exhibition hall on Thursday, unfurling a large "net black spot" poster highlighting 15 countries, including Tunisia, which regularly filtered websites. The public demonstration was filmed by the world's media, but summit security was also spotted filming the crowd with mobile phones. An academic study released to coincide with the summit by the North American OpenNet Initiative found that nearly 10% of the 2,000 sites it tested from within the Tunisia were blocked. A compromise solution for the future of net governance was reached in a late-night meeting. The US-based Icann body will continue to technically manage the net, but a new Internet Governance Forum (IGF) would be formed. In his closing remarks, Mr Utsumi said a new page of net governance had been opened with the decision to form the forum. He said it was recognition that all governments should have equal responsibility for internet governance. But the forum will not have any oversight powers in the technical functioning of the net, but will tackle cybersecurity issues. But, stressed Mr Utsumi, it was only the start of a long process for the net, which would look very different in five years because of the nature of fast-changing technologies. US officials called the agreement on net governance a "win-win" outcome, while Paul Twomey, president and CEO of Icann, was cautious, saying that the fundamental battle over net governance was not over. Despite issues of net governance and freedom of expression dwarfing much of the technology projects and panel sessions, some projects, reports and panel sessions did manage to grab some of media spotlight. Highlights included the unveiling of a working prototype of the sub-$100 laptop, the tool of the One Laptop Per Child campaign spearheaded by MIT media lab director Nicholas Negroponte. The "green machines" are powered with a wind-up crank, have very low power consumption and are designed to help children all over the world interact with each other while learning. Tucked away in temporary rooms within the summit halls, hundreds of panel sessions and meetings took place to debate and to showcase ways of practically pushing the digitally developed and digitally dispossessed nations closer together.